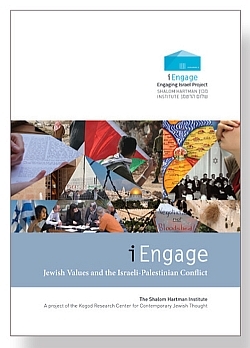 Through the study of Jewish narratives about Israel and the unpacking of the complex meanings of peace in Jewish tradition, participants are invited to explore the ideas and values that animate different attitudes toward the conflict and how these values shape their own political understandings. Though a common political platform may not be attainable, this course strives to achieve a shared respect for our differences. What is the significance of the State of Israel as a Jewish public sphere? The focus of this second Engaging Israel series is to confront the challenge of creating a Jewish and democratic public space in the modern State of Israel – a shared common space for a people divided along tribal affiliations: religious, ideological, national, and geographic. The Tribes of Israel begins a conversation to restructure the relationship between the collective and the individual "tribes" that comprise it – a relationship where tribal affiliations, convictions, and rights are balanced against collective consciousness and identity. Engaging Israel: Foundations for a New Relationship is a series of nine lectures and conversations with Hartman Institute scholars led by Rabbi Dr. Donniel Hartman that responds to growing feelings of disenchantment and disinterest toward Israel among an ever-increasing number of Jews worldwide by creating a new narrative regarding the significance of Israel for Jewish life. Lecture and discussion participants include Dr. Tal Becker, Yossi Klein-Halevi, Rabbi Dr. Rachel Sabath Beit-Halachmi, Prof. Gil Troy and others. The Engaging Israel video series comes with one source book. Senior Hartman Institute faculty members delve into the idea of Jewish Peoplehood - its complex origins, its implications and how it might be sustained. An issue of wide concern in the Jewish community today, the concept of a “Jewish collective” appears at odds with a contemporary ethos of intense individualism. This video lecture series presents a broad and deep analysis of some of the tensions that Peoplehood raises in classical Jewish tradition and contemporary Jewish thought and life. The Peoplehood Video Lecture Series includes nine curricular units containing video lectures on DVD and USB, Source Book including all texts referenced in the lectures, plus additional supplementary sources and recommended background readings. In an age of radical polarization in modern society, with a rise in religious fundamentalism on the one hand and a rise of atheism on the other, how does Jewish tradition approach dilemmas of faith? In this series, Hartman scholars explore the foundational issue of faith, engaging in broad and deep analysis of some of the many dilemmas that faith in the modern world raises. Based on classical Jewish tradition and contemporary Jewish thought and life, the Dilemmas of Faith curriculum addresses the big questions raised by the intersection of faith and reason, faith and history, faith and politics, and the faith experience. Images of Israel is a six-part adult study program that empowers groups of Christians to have a robust experience in learning about Israel in its complexity, while bringing Christian theology and values into the conversation. The heart of Images of Israel is engagement. Participants work with texts, ideas, images, fellow learners, and leaders to explore Israel—as a state, as a people, as a nation, and as a land—and to clarify the commitment of Christians to work for justice and peace among Palestinians and Jews. Images of Israel includes six units containing a total of 14 video interviews and presentations including “A Walk on the Via Dolorosa,” “Intersecting Holiness at the Temple Mount, ” and interviews with Israeli and Palestinian, Jewish, Muslim, and Christian leaders.